White grubs may be the most damaging turf insect pests in the United States. According to the U.S. Department of Agriculture, Japanese beetle grubs alone cause an estimated $234 million in damage each year— $78 million for control costs and an additional $156 million for replacement of damaged turf. Japanese beetle and masked chafer adults are attracted to turf with moist soil which means they are especially attracted to lawns that get watered during hot dry spells. During the feeding period, female beetles intermittently leave plants, burrow about 3" into the ground— usually into turf— and lay a few eggs. 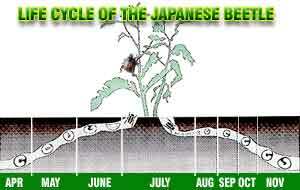 This cycle is repeated until the female lays 40 — 60 eggs. Moist soils are certainly easier to dig through than hard, dry soils. Eggs will dry up and die under very dry soil conditions. The eggs also die when soil temperatures are around 90°F. Higher soil temperatures are typically associated with drier soils, as well as high air temperatures. Lawns having numerous white grubs soon will show signs of injury. If browned areas haven't recovered once cool evenings return with adequate moisture check for white grubs 1" — 2" below the surface. Damaged grass areas will typically just peel back when pulled or raked. When the grass is pulled back you'll probably notice one or two white grubs, but with a little scratching, you'll soon uncover quite a few. The threshold for lawn damage is 5 - 6 grubs per sq. ft. which means that if you have more than 5 grubs in a square foot area, you'll see extensive lawn damage. Products labeled for use earlier in the season (MERIT) won't control white grubs in the fall. Products containing trichlorfon (Dylox) and carbaryl (Sevin) are faster acting insecticides and will kill grubs in 3 — 5 days. Bayer makes 24 Hour Grub Control which contains Dylox. Be sure to read label directions on white grub control products before purchasing. Treated areas should be watered to at least 1" deep before application of the chemicals and then after application another 1/2" of water should be applied. have already reached their full size, but it's not too late to make repairs.